In keeping with the theme of marsh birds during this rainy weather, I decided to cover another very common group of marsh/lake birds, the terns. Terns are related to the gulls and are similar to them in many ways, but also differ in many ways. (I guess that is why they are terns and not gulls). Both are aquatic and can swim; both tend to be white with black and grey trim; both are very noisy; in both groups, males and females are the same. They differ in that: gulls are regular swimmers while terns seldom swim; gulls stray from water and look for food on fields, parks and garbage dumps while terns do not; gulls eat just about anything while terns almost always catch their prey. Nothing written above is very useful in identifying terns in the field, however, there are field marks that distinguish the two groups. First, most terns are white headed with a black cap; gulls do not sport black caps. Second, a tern’s bill is usually red and is always slender and sharp; a gull’s beak is usually yellow and always blunted at the tip. Third, terns are usually smaller and more delicate than gulls. Fourth, terns have longer tails that are usually forked to some degree. Fifth, terns have longer and more pointed wings. Sixth, terns are much more buoyant and graceful fliers. Overall, a tern looks like a gull that has many of the physical characteristics of a swallow. For non birders, a tern is like a tricked out sports car while a gull is more like a minivan or SUV. Locally, four species of terns can be expected: two are common; one is uncommon; one is rare. This week’s featured bird, the Black Tern, is probably the most common tern around here with just about every permanent slough supporting at least one pair. While, its overall characteristics are definitely that of a tern, its colour scheme most certainly is not. Rather than white, its body is all black with dark grey wings, back and tail. The bill is black and not red like the other terns. Most terns hang around larger lakes and ocean with clean shore lines, but the Black Tern lives in reedy sloughs. It nests on a floating platform on the water while the other terns nest on sandy and rocky shores and cliffs. If it were not for Black Terns, our prairie sloughs would be devoid of terns, altogether. 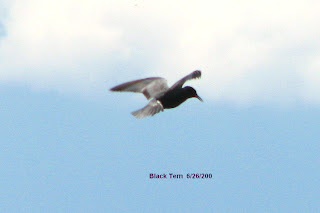 Black Terns are very easy to find and identify even by beginning birders. To see these terns a birder should head out to the nearest marshy slough and wait for the birds to fly over head and start scolding. They do not like intruders. To get a really good look at a Black Tern, one needs to find a slough with fence posts that are still standing in the water. Terns love to perch on these, thus permitting an observer to get a really good look. 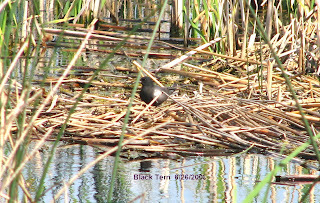 This week I have provided two pictures of a Black Tern – on flying and one sitting on a raft of reeds (perhaps a nest?). Because there were no standing fence posts, I could not get a nice profile shot. This week’s pictures were taken at the same location and at the same time as the pictures of last week’s bird, the Ruddy Duck. With the ripening of the saskatoons, pincherries and chokecherries our backyard has become a hive of activity for fruit loving birds. These include species such as Robins, Cedar Waxwings, House Sparrows, Rose Breasted Grosbeaks, Pine Siskins, Catbirds and Flickers. Most of these birds are well known as fruit eaters, but the House Sparrow, Catbird and Flicker were complete surprises to me. Most surprising was that the Catbird came within a metre of me as I was picking pincherries and proceeded to loudly scold me – for picking her fruit, I presume. I could actually see the anger in her eyes, and she certainly gave me the impression that I was not welcome there. Because of the rainy weather we have had in the last couple of weeks, I felt that another article about a duck was in order. This week’s duck of choice, the Ruddy Duck, is an oddity that is considered to be a remnant of an ancient group of ducks called stiff tails. The only other stiff tail in North America is the Masked Duck – a Mexican species that is a rare visitor to the very southern part of Texas. 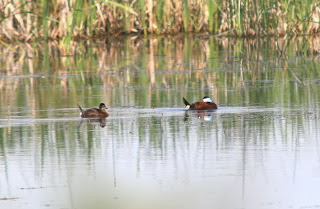 On the other hand, the Ruddy Duck is very common throughout North America. Being a diving duck it can be found on any slough that does not dry out during the summer. The male Ruddy Duck is one of the most recognizable ducks on the pond; the female, like most ducks, is typically a drab grey brown. As its name implies, the male is rusty red with a black head and striking white face. The bill is a bright sky blue. If these characteristics are not enough, then its odd habit of cocking its tail more or less vertically in the air as it is swimming giving it a two headed appearance should clinch its identification. Both males and females often swim this way. In the spring the males makes a very distinguishable sound. To me it sounds like a popping rattle that lasts for a second or two speeding up towards the end. When viewed the head bobs up and down more or less in time with the sound. Another interesting feature of this bird, that is of no use whatsoever in identifying it, is that the female Ruddy Duck lays one of the largest eggs in proportion to body size of any bird in the world. Unlike most ducks that lay large clutches of eggs, the female Ruddy lays only one or two. Who could blame her. For those of you who enjoy watching and identifying ducks, this one is a good choice. This small unique diver is common and easy to identify. This week’s photo was taken just east of Tuffnell across from the Margo Road. As I mentioned in article No. 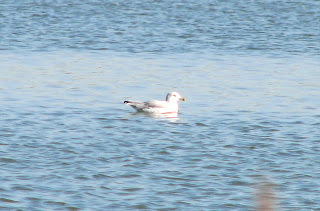 12, there are two white headed gulls that occur regularly in our area. One is the less common California Gull and the other is the very common, and this week’s featured bird, the Ring Billed Gull. Since I had already covered all gulls in general quite extensively in articles 12 and 31, I did not feel that I should devote an entire article to the Ring Billed, however, because it is so common, I eventually decided otherwise. Like the black headed Franklin’s Gulls, both the California and the Ring Billed follow farmers working their fields. The California and the Ring Billed are very similar in size and appearance. The California is slightly larger, but even in mixed flocks size is not useful in separating the two. That being said, it is still very easy to tell the two apart by the markings on their bills. The California has a bright red spot on the lower mandible (equivalent to “jaw”, in animals) towards the tip followed by a black line just in front of the red spot; the Ring Billed has no red at all, just a black ring that goes completely around the bill as if somebody put a black elastic band around it to keep the bird quiet. (Sometimes one is tempted). When observing white headed gulls in the field, if there is red on the bill the gull is the California; if there is no red, the gull is the Ring Billed. For the very keen observers, if the red spot is not followed by a black line, then the gull is the much scarcer and larger Herring Gull. This gull is found along both coasts and across Canada on very large bodies of water, and the odds of seeing it here are very slim except during migration. The Ring Billed is only moderately migratory flying only as far south as the nearest open body of water. Even though the Ring Billed can be found as far south as Mexico, it is a year round resident in Canada in extreme southern Ontario and the interior of southern British Columbia. Since it is so common anybody should be able to see and identify one with a minimum of effort and difficulty. When most people see a bunch of birds swimming in a slough, they tend to think of them collectively as ducks, or geese if they are larger. However, not everything that swims is a duck or a goose. There are coots, phalaropes, loons, gulls, terns, mergansers, scoters and grebes. At a distance all look somewhat “duckish”, but at close range or with binoculars the distinctions are quite discernible. This week I shall deal with the family of swimming birds known as grebes. Grebes are not related to any other group of birds, but most closely resemble loons in appearance and habits. Like coots but unlike ducks or loons, a grebe’s foot is lobed but not webbed; like loons but unlike ducks or coots, a grebe’s legs are so far back that the bird cannot walk on land because it is front heavy; like coots, loons and diving ducks but unlike dabbling ducks or geese, a grebe’s nest is a floating platform anchored to a rush or reed; like loons but unlike all other waterfowl, the young must be fed by the parents; like loons, coots and geese but unlike ducks, male and female grebes are the same. A grebe’s food source is animal in nature and includes items such as fish, tadpoles and aquatic insects. Like all waterfowl a grebe’s young can swim shortly after hatching, but since most of their food items are found underwater the young must be fed by their parents because they do not have the ability to chase and catch their prey by themselves. With one exception, all grebes have sharp pointed beaks with which to catch and hold live prey. There are four species of grebes in the area, three of which are common. The larger grebes require larger bodies of water and the smaller ones smaller bodies of water. This week’s featured grebe, the Pied Billed, is one of our smallest grebes and least like the other members of its family. While most grebes have sharp pointed beaks, the Pied Billed has a much blunter and higher one giving it a big nosed appearance. It also has the unique ability to gradually sink out of sight without leaving a ripple on the surface of the water. Moreover, it can hold a submerged position with only its head above water. 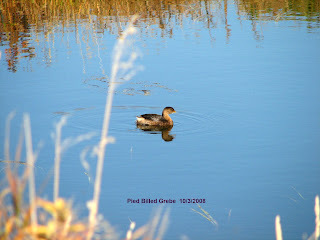 These characteristics have earned the Pied Billed Grebe the nicknames of Water Witch and Hell Diver. Both names are very appropriate. The young of all grebes have striped heads with light and dark lines running longitudinally from front to back. The young of the Pied Billeds are completely striped from to back and look like little floating zebras. Although they can and do swim they do not seem very enthusiastic about it when they are very young, so they spend a great deal of time riding on their mother’s back. When the mother dives, as she must, the young are left floating, and when the mother comes back up, they quickly scramble onto her back. As the young mature they gradually become more independent until they leave their parents completely and get ready for migration. As with all water birds in northern zones, Pied Billed Grebes have to migrate, but are only moderately migratory flying only as far as the nearest open water. Some do fly as far south as Mexico. In Canada, they are year round residents only in coastal areas of British Columbia. This week’s photo was taken last year along the Dunlop Road just north of town. Being as common as they are, they should not be difficult to spot. First, here is an update on the status of the Collared Dove. After hearing and seeing it for several weeks in and around our yard, it seems to have moved on. It has been several weeks since I last heard it. Because there was only one dove around, it is an even bet that it moved elsewhere in hope of finding a mate. We wish it luck. 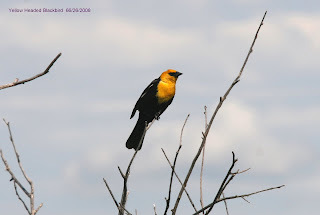 One of our more colourful and conspicuous marsh birds is the Yellow Headed Blackbird. Even though it lives in marshes, it is more closely related to its upland relative, the Meadowlark than to its wetland neighbour and distant relative the Red Winged Blackbird. The Yellow Headed Blackbird is Robin sized and one of the largest perching birds found in marshes. The all black males with their conspicuous white wing patches and bright yellow heads are unmistakable. The females are a much more subdued striped brown colour with faint yellow head markings and faint white wing patches. Even though Yellow Headed Blackbirds are considered songbirds, they certainly have not lived up to their potential. They do sing, but the various renditions are awful to say the least, except to other Yellow Heads. Unlike the Red Wings, which can be found in any little pond that is capable of sustaining a few rushes, the Yellow Heads require larger bodies of water with a good growth of reeds and cattails. Like the Red Wings the Yellow Heads are territorial and do not nest in dense colonies like, for example, the Purple Martins. Although the Yellow Headed is common in larger sloughs around here, it is a bit of a rarity in much of the USA. As a result many birders will go to great lengths to observe one. Locally, all we have to do is go to any of our larger sloughs and watch. For example, this week’s photo was taken just off the transcanada highway east of Tuffnell. I particularly like this slough because a narrow country road, with very little traffic, runs through it providing an excellent viewing area. If anybody wants to see a variety of shore, water and marsh birds this location is a must. Not only are there a lot of birds, but one can get quite close to them. The birds seem to sense that humans just have to stay on the road and will not bother them in the water and muck. Considering the number of country and back roads in the area, I am sure that there are other places that are just as productive. One just has to try. For the next three or four weeks I will be busy with other matters and will be unable to write any birding articles during that time. To those readers who read the articles, I apologize. “See” you in August.